Doncaster Knights resume their bid to secure a third successive top four Championship finish when they entertain second-placed Ealing Trailfinders at Castle Park tomorrow (2.30pm). Knights, who were in B&I Cup action last weekend, go into the game down in seventh place following four successive league defeats. But with only six points covering the five main contenders for the remaining two top four spots, Knights remain in the frame. Were the club to finish in the top four again director of rugby Clive Griffiths said it would represent one of their greatest achievements. 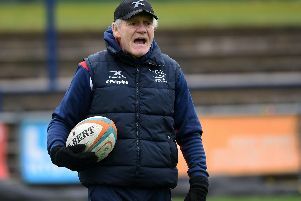 “The number of key decisions which have gone against us, the injury situation and the death of Ian Williams have all had an adverse impact and we’ve often had our backs to the wall,” said the Welshman. Knights face the toughest run-in of any of their rivals with back-to-back games against the two sides who have dominated the division this season. They crashed to a 57-14 defeat on Ealing’s 4G pitch back in November. Although not trying to gloss over one of the club’s biggest defeats at this level, Griffiths claims there were extenuating circumstances. “Although they obviously played well on the day we took a very weakened team down there due to injuries and that contributed to the size of the defeat,” he said. Griffiths wasn’t happy with comments on social media and in the press made by some of the Ealing players. “I’ve kept those comments and they will form part of my team talk ahead of the game,” he said. “It wasn’t insulting or anything like that but you don’t rub it in when you win by that sort of score. “The biggest motivation for the players who played down there will be remembering the feeling after the game and they’ll be wanting to try and turn the tables in the return. “I just hope that in the last month of the season we can have a level playing field when it comes to decisions and everyone plays to the best of their ability and we finish the season off with a smile on our faces. Neither Mat Clark, Tom Hicks or Charlie Foley finished the game at Jersey.